As veterinarians we are often asked to evaluate horses for chronic lameness. An owner may want an initial lameness exam or be seeking a second opinion on a previously diagnosed problem that has not resolved. Too often we see horses that have been "diagnosed" with "Navicular Disease" without ever undergoing a complete diagnostic work up. The owner may grow frustrated with the diagnosis when the lameness hasn't improved or resolved. Navicular disease or syndrome is not a radiographic diagnosis, it requires multiple diagnostic tools and clinical evaluations. This case report is an example of a horse that presented for previous radiographically diagnosed "Navicular Disease" and what we found on our complete clinical examination. Case Presentation: "Ranger" a 7 year old American Quarter Horse gelding presented to Conley and Koontz Equine Hospital for a second opinion. The horse had a lameness in the right front which their original veterinarian attributed to caudal heel pain or navicular disease. Based on the original veterinarian's diagnosis, the owner had been treating for navicular disease with no improvements. Physical Examination: On presentation the horse had a grade 2/5 lameness in the right front limb. There was no apparent swelling or physical abnormalities. Diagnostics: Due to the history of lameness and no improvements, the owner had become discouraged and asked us to start over with the lameness examination. Hooftesters were applied to the hoof with no apparent abnormalities. A wedge and reverse wedge test were performed with very little change. The horse was lunged shortly in the round pen with some worsening of the lameness when the right front foot was on the outside. 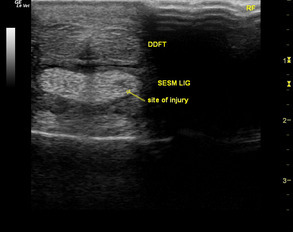 Nerve blocks to localize the lameness were performed. A palmar digital nerve block, which blocks the heel region, navicular bone, and the sole, was performed with very little improvement. Moderate improvement was achieved with a pastern ring block. Because of incomplete resolution of the lameness, an abaxial sesamoid block was performed. The lameness resolved completely with this block. Based on the localization of the lameness with perineural anesthesia, radiographs and ultrasonic examination of the pastern region were performed. Radiographs: The referring veterinarians radiographs were reevaluated and found to have a small cystic structure along the flexor surface of the navicular bone. Standard radiographs were taken to evaluate the distal limb. There were no additional bony abnormalities on plain radiographs. In light of the nerve blocks it was determined that the navicular changes were not significant and suspected to be incidental. 1. Stall rest: Based on the chronic nature of the lameness, we did not feel this was a viable option, but it was offered to the owner. 2. Stall rest with shockwave therapy: Shockwave therapy has proven to be a very beneficial treatment option in the management of lameness in the horse. Click link to read more about shockwave therapy. 3. Regenerative Therapies: In the last couple years, regenerative therapy has become the mainstay of therapy for soft tissue injuries. There are various options which are commercially available, but we routinely recommend either platelet rich plasma or stem cell therapy. 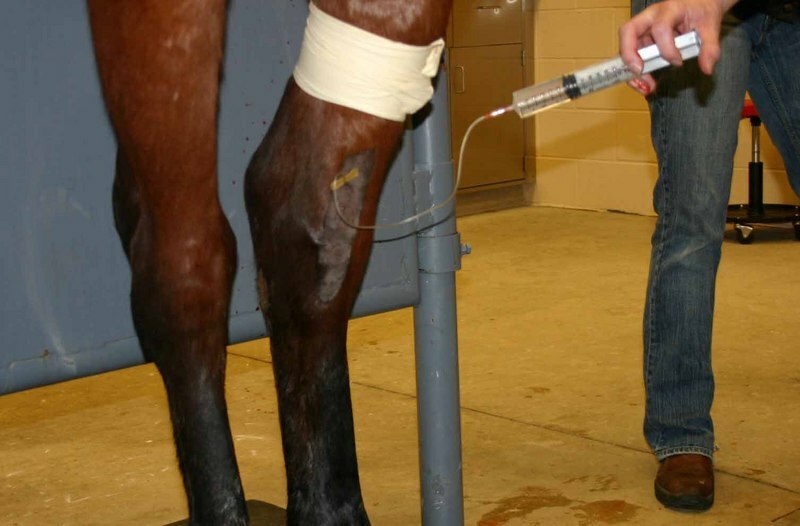 It is our opinion at Conley and Koontz Equine Hospital that regenerative therapies coupled with shockwave therapy give us the best chance for resolution of lameness.Click link to learn more about regenerative therapies. Treatment Plan: Based on the chronic history of lameness and the owners desire to proceed with the greatest likelihood of recovery, we decided to treat Ranger with shockwave and stem cells. An intense treatment schedule was made and therapy began promptly. It was recommended that shockwave therapy be performed every two weeks for three courses of therapy. At the first shockwave appointment adipose tissue was collected and sent for culture. The horse was placed on stall rest with minimal hand-walking while we were performing the shockwave therapy. The stem cells arrived after approximately 3 weeks after adipose collection. Because of the size of the lesion it was decided to perform an intravenous regional perfusion to administer the stem cells (figure 3). The horse was discharged to return in two weeks for a final shockwave therapy. After the final shockwave therapy, the horse was discharged to home with instructions of minimal hand-walking and a recheck after a total of 90 days. Follow-up: At 90 days post treatment, Ranger returned for a follow-up examination. 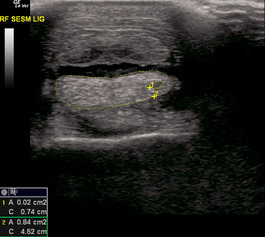 An ultrasound examination was performed and the lesion was found to be resolved (Figure 4). A lameness examination was performed and he was found to be sound at the trot. The trainer and owner were instructed to give the horse an additional 30 days of restricted controlled exercise, but they could gradually increase the amount of exercise he was receiving. Discussion: Perineural anesthesia or nerve blocks are the mainstay of a thorough lameness examination. Too often, they are performed inappropriately or skipped altogether. Sadly, this can result in a misdiagnosis. Proper application of nerve blocks as well as timing to observation afterwards allows for an accurate diagnosis. Too often, the horse is allowed to sit for an extended period of time allowing the local anesthetic to diffuse cranially leading to a misdiagnosis. In Ranger's case, the initial diagnosis was made on radiographs alone. In other cases we have reevaluated, we suspected the palmar digital nerve block was performed too far up the limb or the horse was allowed to stand for an extended period of time allowing the local anesthetic to diffuse up the limb and the area of injury. When performing an intensive lameness exam at Conley and Koontz Equine Hospital we are focused on just one horse and therefore can dedicate our full attention to the horse and the outcome of the nerve blocks. Shockwave therapy has been used for treatment of soft tissue injuries and pain for over 10 years. It has been shown to help the quality of healing, but not necessarily the time to resolution. In this case we used shockwave for two reasons. The first was to help with the quality of healing. The second was due to the chronicity of the lesion, we used shockwave to help attract the stem cells to the area of the injury. In chronic cases there is a concern that chemical and physical mediators which attract and regulate stem cells are no longer present. The use of the shockwave therapy would help to create a low degree of inflammation and help attract the stem cells administered through intravenous regional perfusion. Regenerative Therapies are becoming more and more popular for treatment of soft tissue injuries. Platelet rich plasma and stem cell therapies are available from various commercial companies and we offer both in our hospital. Because of the success of stem cell therapy, we frequently recommend this over platelet rich plasma, but there is a cost difference between the two therapies. Too frequently as veterinarians we are presented with lame performance horses which have been misdiagnosed and mismanaged. Too many times we are faced with horses that have been given the easy diagnosis and told to rest or have had multiple joints injected hoping that this helps resolve the lameness. By the time a horses receives multiple joint injections, they have been given a systemic dose of steroids and of course they would feel better, but we have not got to the root of the cause. With the improvements in technology such as digital radiography and digital ultrasonography, we are able to image and diagnose previously difficult lameness cases. 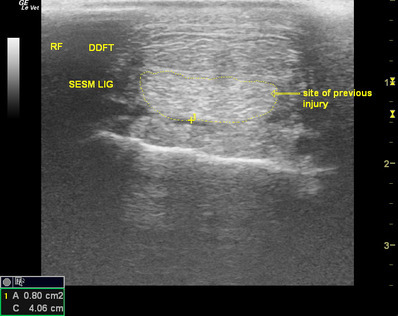 In this case, we used three standard nerve blocks and digital ultrasonography to make a relatively simple diagnosis. With the combination of shockwave and stem cell therapy we were able to make an aggressive therapeutic plan and successfully return Ranger, within a few months, to the level of competition he was at prior to his injury.